The executive mayor of the City of Ekurhuleni Mzwandile Masina is no stranger to youth activism. He joined the Congress of South African Students at the tender age of 16, in reaction to the oppressive language policies introduced by the apartheid regime. Masina later progressed into in the African National Congress Youth League, where he rose up the ranks to ultimately lead the organisation as national convenor. He does not believe that issues affecting the youth should be considered as an afterthought; they must form the basis of all policy decisions made by government. This principle also underpins the work of the Ekurhuleni city manager, Dr Imogen Mashazi. As city manager, she is responsible for implementing and overseeing policies crafted by the city council including day-to-day management responsibilities that include financial planning, allocating physical resources and staff management. She is passionate about issues facing the youth and women. Delivering a keynote address at a Take a Girl Child to Work Day event on May 31, Mashazi bemoaned the high level of gender-based violence in our society and called for the empowerment of women in general. “While progress is evident in certain areas, we however continue to see numerous shocking incidents of the girl child being murdered and abused in recent times. The latest incident being that of the two Vryburg school girls who were murdered at a school hostel,” said Mashazi. Meanwhile, the executive mayor has heeded the call made by President Cyril Ramaphosa during the State of the Nation Address at the beginning of the year, “Now is the time to lend a hand, now is the time for each of us to say ‘send me’, thuma mina”. Upon assuming office in 2016, Masina has swiftly moved to implement measures that support youth development in the City of Ekurhuleni. He began by increasing the Mayoral Bursary Fund from R10-million to R100-million annually, with an intention to double this amount and go beyond R250-million by 2021. Masina said: “We need to empower the youth of Ekurhuleni with the tools build a better future. Education will allow the youth in the City an opportunity to become more employable and capacitate with the prerequisite skills to start their own businesses. Every child who is deserved and capable should be granted the opportunity to further their education. Masina went on to support youth empowerment by pronouncing that R12-billion of set-asides must go towards youth-owned companies. To date over 1 722 companies have benefited from the youth set-asides. The executive mayor launched the project Mintirho ya Vulavula (“deeds speak”), which focuses on youth, women, people with disabilities and learner contractors. Over R1-billion has been budgeted for this project, in the hopes to accelerate the upliftment of these vulnerable groups. 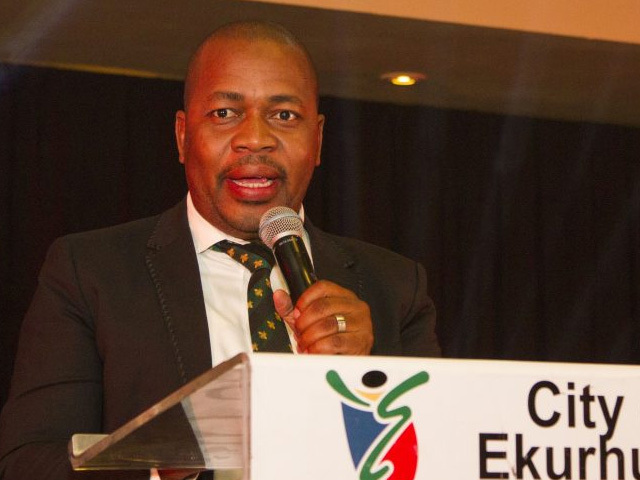 Masina believes the most important initiative being undertaken by his administration is the establishment of the Ekurhuleni University of Applied Sciences and Technology. In just under a year, the City has successfully held a university symposium with various stakeholders to gather insight on recommendations for the university. The City has also identified a location for the university to be built and a university advisory council is in the final stages of being set up. “We can no longer refer to the Fourth Industrial Revolution as a looming disruptor; it is here, and urgent steps need to be taken by government in order to mitigate the adverse effects of technological developments. Automation and Artificial Intelligence are massive threats to job losses in the near future. The Ekurhuleni University of Applied Sciences and Technology will seek to provide the youth with relevant skills for the jobs of the future. We are glad to announce that the minister of higher education has acknowledged the City’s request for the establishment of a university in Ekurhuleni and has subsequently assigned officials to work with the City to realise this vision. It will provide the youth of Ekurhuleni with the opportunity to lead the country as the first to enrol in such a university. “Our planning process towards the establishment of such a university will equip youth with a unique skill set that is currently associated with advanced countries such as Japan, China, South Korea and the United States which are leading in the areas of science, technology and robotics,” said said Masina.